Today, the G-IV completed a crossing of the Intertropical Convergence Zone (ITCZ) painting tall towers en route with the tail doppler radar. 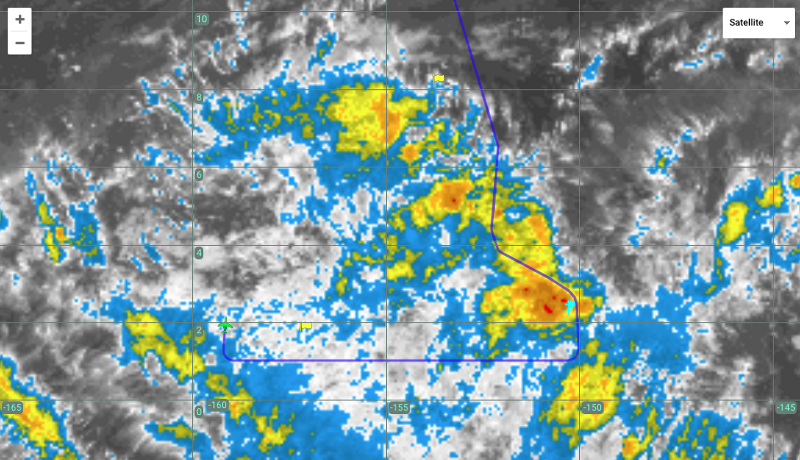 This was the fourth successful flight to circuit convection in the last five days in an unprecedented sequence of four intense research flights to cross the ITCZ in the last five days with a cumulative 29.6 flight hours and 119 sondes deployed. 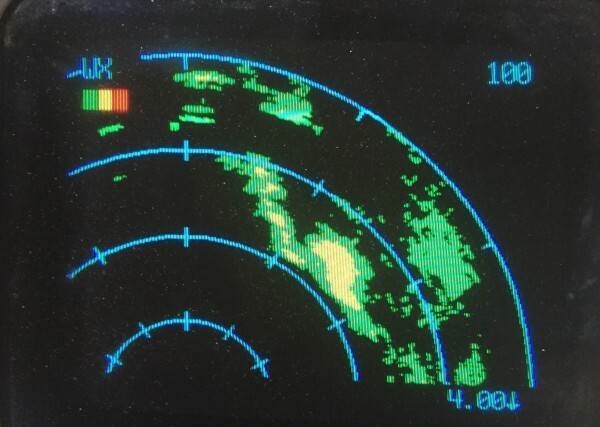 The image at left, from Flight Director Mike Holmes, shows echoes off the right wing during today’s flight from the operational weather avoidance nose radar. After navigating around the towers that were later observed to produce multiple lightning strikes, the G-IV flew an exciting east to west leg through a cyclonic circulation pattern to the south and west of severe thunderstorm activity. Today’s flight was 7.7 hours and included 29 good dropsonde launches. With nominally four G-IV research flights remaining in the ENRR project and increasing prospects for high-impact weather along the U.S. West Coast, we are planning to implement a more systematic outflow sampling approach, nominally every other day through the end of the project, to inform numerical weather prediction. The NOAA49 flight crew will ferry back to the Continental US no later than Friday, March 11.